Why “art” and ascension? Because art takes us to another plane both as creators and observers. Whatever the discipline, art involves body, mind, heart and soul. To create art is to transmute denser matter, lower thought-forms, onto the higher planes of love/wisdom, compassion and understanding. Through the imagination we move into dimensions of lesser density and lighter fields of awareness where we access the intuitive plane. 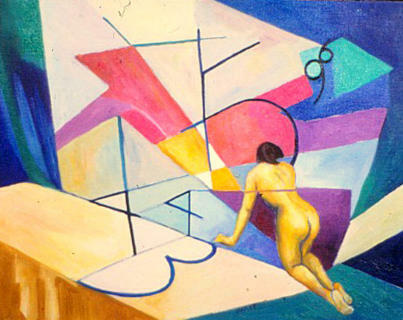 Works of art “step down” higher states of awareness onto the physical plane. Art might be considered as the portal into the World of Meaning and Significance. Whether it’s reality you’re painting, or dreams or visions or mental or emotional states, it’s about creating a different reality. It’s about seeing, and it’s about the power of seeing, and figuring out exactly what we do see. First and foremost, ascension is a process. Ascension is a gradual shift, a shift in awareness, a shift in perspective, a shift in vibration, a shift in attunement, a shift in alignment with who one truly is, so that there is full agreement, full participation, in the process. Ascension is a universal motion, a yearning, a striving, a releasing, a surrendering, a joyous culmination of our journey here in physical form. Dictionary meaning of ascension: To go or move upward, to rise. To rise by degrees, from the lower to the higher notes of a musical scale for instance. To move or slope upward. To ascend a mountain. From the Latin, meaning to climb. So we have this sense of the word as meaning rising above where we presently are. Of going up, as to Heaven. Creating works of art would seem to be a natural and uncomplicated method of Spiritualizing Matter, both for the artists themselves and for those that resonate with the work. The incompatibility between spirit and matter compresses itself like a rushing vortex. When the spirit is burdened by contacting imperfection through the shell, it begins a battle which discloses the imperfection. The shells that impede the spirit are like encumbrances obstructing the path. Truly, encumbrances! The cosmic creativity incessantly clears away strivings toward darkness. Humanity’s chief lack, lack of understanding, lies in this expressed disharmony. When the spirit and the shells which clothe it will be in harmony, humanity will come closer to the cosmic union. “This work of wrestling with matter in order to subjugate it to divine purpose is the millennial work of the ages. It is the goal—18 million years old—of the Hierarchy of Loving Wisdom and, as we are told, it is the challenge of Sanat Kumara, the Lord of the World and the Ancient of Days. Its’ objective is the transformation of Planet Earth from its current status as a non-sacred planet into a sacred planet. “This objective, as some have conceptualized it, is to ‘bring heaven to earth,’ to imbue substance with spirit, to lift and beautify matter and to electrify its vibratory frequency, so that humanity can awaken to the Greater Whole of which this planet is a part. Nancy – your words, your art, move me. Thankyou. Very deep, profound, beautiful and true.